You have done the all the big capital outlay for the business – property, vehicles, plant and equipment, branding and the like. Your business is now at a stage that you need staff. And you thought the big costs were over – wrong! When you look at the costs involved with recruiting a new employee and getting them up to speed you can easily match the cost of more than one of your company vehicles. Unlike a vehicle a significant part of that cost will be repeated every year in the form of wages. Get that employment decision wrong and much of that initial cost is repeated. Academic studies have shown that the cost of recruitment, when all factors are taken into account, can equate to one and a half times the new employee’s annual wage. It makes a lot of financial sense to get this process right first time. 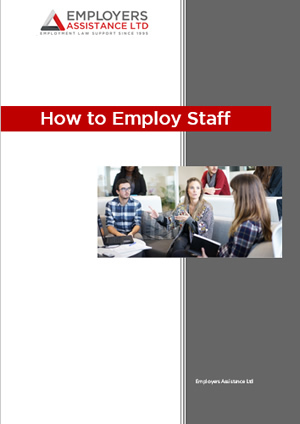 With this in mind our “How to employ staff” guide gives practical advice on the process without binding you up with complex processes. From creating a job description based on the needs of the business through to interview questions, what to ask and how to ask it, the guide provides information to help you. Faced with several worthy candidates the guide provides a method for you to target the most suitable candidate and gives information about checking them out and signing them up. 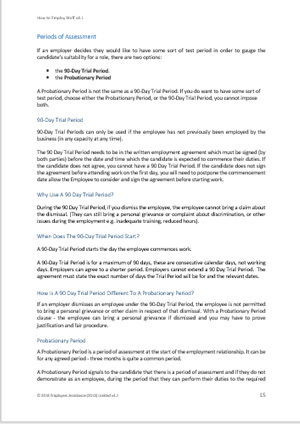 Our guide has sample forms and letters to use throughout the process and to help orientate the new employee when they start work. Notes on legislative compliance are provided to help you get the basics right. This eBook package contains the book in .pdf format and the forms pack. The forms are also available as individual word documents so that you can tailor them to meet your specific needs.